Spearhead Winery in the Kelowna area is well-known for their Pinot Noir wines. How many do they make? There is their entry-level, white label Pinot Noir, their GFV Saddle Block Pinot Noir, their Golden Retreat Vineyard Pinot Noir, and their Cuvee Pinot Noir. But wait, there is a surprise. They just released a new Pinot Noir; their White Pinot Noir 2017. Pinot Noir is red, right? Yes, but you can make white wine from a red grape by pressing off the juice with minimal contact with the skin. Have you ever sipped a Blanc de Noirs Champagne? That Champagne is made from wine from the Pinot Noir grape (and also possibly Pinot Meunier), that has undergone a second fermentation in bottle to create the bubble. When I first sipped Spearhead’s White Pinot Noir, it reminded me very much of Sauvignon Blanc, but with a few subtle differences, which I will describe in my tasting notes below. Why would you make a white wine from Pinot Noir in the Okanagan? We have a very limited area to grow grapes, Pinot Noir is difficult to grow, and to produce a quality red wine; and commands a premium price to the consumer. The answer for Spearhead Winery is “Quality”. They want to produce red Pinot Noir wine from optimum sized grapes, that are picked at the perfect level of ripeness. Some Pinot Noir grapes grow too large and you get more pulp compared to skin. That will produce a Pinot Noir that may not be as flavourful as a smaller, fully ripe grape. Wouldn’t it be difficult to walk through an entire vineyard to look for bigger Pinot Noir grapes? Yes, but that is not what they do. They know that the last 2 or 3 vines at the end of each row have less competition with adjacent vines so these vines can get more water and minerals from the soil, and sun, so that these grapes grow larger. Logically then the winery can concentrate on the edges of the rows, and possibly the first/last row in the vineyard and pick those grapes that are larger than the optimal size. To get enough grapes to produce a viable amount to turn into wine, Spearhead Winery selected grapes from the Golden Retreat, Harvest View, and Coyote Vineyards. Spearhead picks these grapes two weeks sooner than the rest of the Pinot Noir grapes, so they are not quite as ripe and as a result, have a bit more acidity and less sugar. These grapes again are quickly pressed off their skins and fermented as white wine, then bottled. Which leads me to my wine tasting with Spearhead Winery, with a glass of this interesting wine to sniff and sip, and make notes. This leads me to the second surprise from Spearhead Winery. They have a new winemaker. Grant Stanley, who is well-known for his 10+ years working at Quails’ Gate Winery, then another 5 years at 50th Parallel Estate. 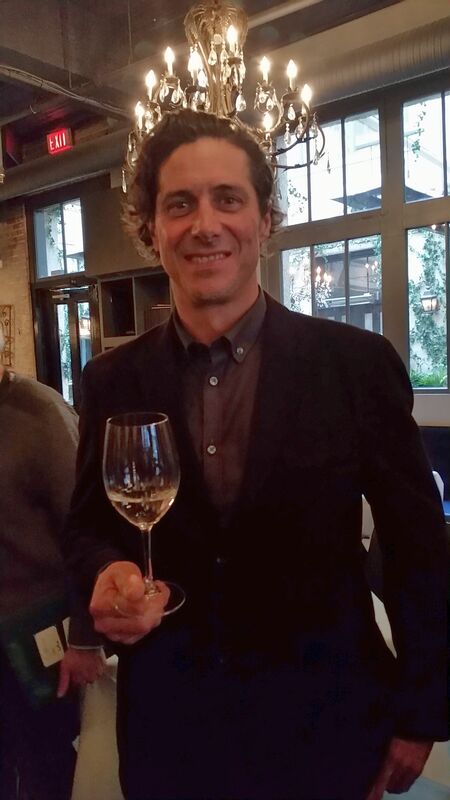 Before working in the Okanagan, Grant went to New Zealand to learn winemaking and worked for several years at Ata Rangi, where he did six vintages. New Zealand is well-known for producing quality Pinot Noir, and some could say that this is their signature red grape. Grant joined Spearhead Winery in the Spring of 2017, where he managed this year’s harvest, but also has the task of blending the Pinot Noir wines from the previous vintage. Grant has a love for Pinot Noir and it shows in the quality wines he has produced in the Okanagan. Joining Spearhead Winery, a small-scale producer of Pinot Noir, gives Grant the ability to fine tune, and bring out the best of the Pinot Noir grape, from single vineyards, single clones, and blended wines for us to enjoy. The White Pinot Noir was Grant’s idea. In part due to picking these not quite optimal grapes for red wine production, and partly due to his exposure to this type of wine made by other winemakers that he knows. This experiment, or “paradox”, as Grant calls it, created a very interesting, quality white wine. Let me tell you what I thought of this wine, as well as their other wine and a rosé wine that they are also releasing at this time. 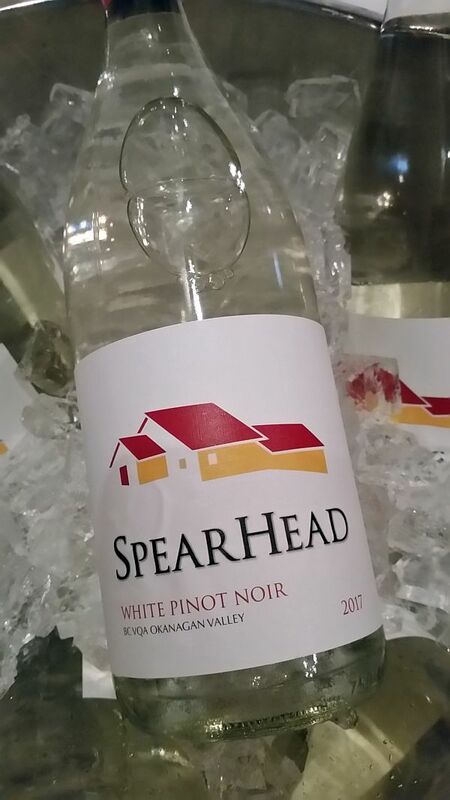 Spearhead Winery White Pinot Noir 2017 ($24) – This wine is pale straw in colour. It has a very herbaceous nose, which over time with exposure to air, also included a gooseberry aroma. The wine is slightly off-dry and roundish on the palate. Medium acidity and medium plus in flavour intensity. It has tropical fruit flavours with a herbal edge. As the wine lingers on your palate it softens – a Sauvignon Blanc would keep its acidity level to the finish. The wine finishes with some leafiness. A delight in the glass. I can see enjoying this wine with seafood as well as with lightly flavoured cheeses and charcuterie. I did have a chance to try this wine with some firmer textured cheeses, as well as chicken and beef charcuterie, and it worked very well. Spearhead Winery Riesling 2017 ($20) – The grapes for this wine come from their Gentleman Farmer Vineyard. The wine has an orange, citrus, sweet nose. It is off-dry, round with medium plus body. It has lower acidity and a thick mouthfeel. Favours of tropical fruit, followed by orange. It finishes with tart citrus fruit flavour. Spearhead Winery Rosé 2017 ($21) – This rosé wine is made from their Pinot Noir grapes. This time the grape skins stay in contact with the must for 48 hours, to give the wine its rosy colour. 100% stainless steel fermentation. The grapes come from The Rise Vineyard in Vernon. The wine is pale Alberta rose petal in colour. Aromas of strawberries, floral and acetone, which follows to the palate. I also picked up red cherry flavour. The wine has medium plus body with a thicker mouthfeel and lighter acidity. Some bitterness on the finish. SpierHead Winery does have an online store, and as well has their wines available at many restaurants including Burgoo (all 3 locations), Cin Cin, Hart House on Deer Lake, Araxi, and much more. Here is the full list of restaurants. There is also a long list of retail locations, such as Firefly, Legacy, Liberty (all locations), Village Wines plus more. Here is the full list of retail locations. I look forward to tasting the latest Pinot Noirs produced by Grant when they are released. Will there be a noticeable difference in this new vintage with the past vintages? Is there a new direction? Time will tell as Grant becomes more familiar with the terroir of Spearhead Winery’s vineyards. If you didn’t notice, Spearhead Winery changed their name. It used to be Spierhead Winery, named as they are located at the head of Spiers Road in Kelowna. 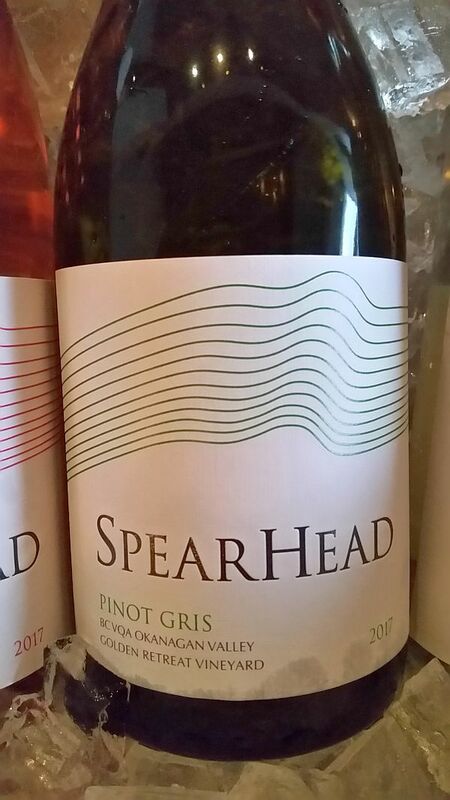 But many people I am told spelt Spierhead as Spearhead, as well as having another winery with a very similarly spelt name, so they decided to go forward with Spearhead.